Traffic entering Wallasey Tunnel at morning peak, with contra flow, i.e. 3 lanes to Liverpool, 1 lane from Liverpool. The red and green sign over the road, asks road users to travel by ferry or train instead! The tower is a ventilation shaft. Birkenhead tunnel made a profit, but due to the building of Wallasey tunnels, there were losses from 1971. Losses were added to the debt making losses worse. There were various toll increases, and since 1992 the Tunnels have been back in surplus. Why should Tolls come down when debts are paid off? Saying that they should not, is like saying you should carry on paying the building society even though you have paid off your mortgage. Merseyside has waited 70 years for the day when Tunnel should be free, the prospect of tolls that are stuck on an up escalator is appalling. Why shouldn't Tolls be used for other purposes? An example they have given of where Tolls may be used is new tram system, but the tolls could be used elsewhere. It is not fair that Tunnels users are seen as a convenient source of money. Do tolls help to reduce congestion? On an average day, the 8 lanes of the Tunnels, seem to carry about the same traffic as the 4 lanes of the toll free Runcorn bridge. 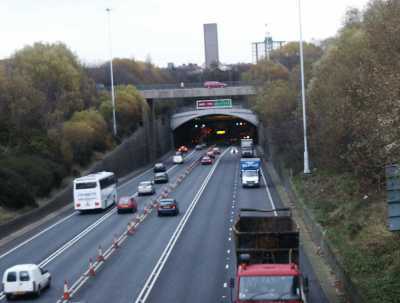 Off peak, if the Tunnels are congested, it is probably because of the regular closures of one of the Wallasey tubes or delays at toll booths. During the peak period, there are many factors affecting congestion in the Tunnels and other roads. Previous toll increases including the massive increase from 60p to �in 1992 had little effect on traffic. Isn't it just the people "over the water" who are affected? More Wirral people regularly use the Tunnels than those from Liverpool. But Merseyside is unique in having a toll on the only road link to get from one side of an urban area to the other. This not only affects people who travel to work by car. Many tunnel users on both sides of the river are travelling for leisure, shopping, business, to visit hospitals and other facilities, and to visit friends and family. Tolls are a barrier to such visits. Tolls affect the local economy and are an extra cost on Merseyside businesses. What about the Runcorn bridge? The present bridge is toll free, the original cost being mainly met by the government. There are plans for a second Runcorn bridge. It hasn't been decided whether it will be tolled. If it is, then it will be underused, and if it isn't then why should we continue to suffer tolls? Most river crossings around Britain are free or have lower tolls than the Tunnels. What should happen with the Tunnels then? First there should be real consultation with the people who work in the Tunnels. Then there need to be discussions with the authorities that may take over the running of Tunnels and the government who may be asked to write off some of the old debt that is payable to them. We would expect that very gradually tolls would be phased out, possibly starting with reductions in off peak tolls.